Lovely island, too many explosions. For years, that summed up Vieques, a verdant wedge of land off the eastern edge of Puerto Rico that the U.S. Navy used to test weapons. The Navy left in 2003, but the lovely island remains, still surrounded by sparkling blue waters, still ringed with delightful beaches, and now offering visitors the chance to discover a place  an experience  like Hix Island House. Canadian architect John Hix's goal was to give guests "a direct connection with climate and nature." His design was influenced by Vieques' own granite boulders and the Japanese wabi-sabi philosophy, which, in building, holds that objects can grow more beautiful and more in concert with their landscape as they age. 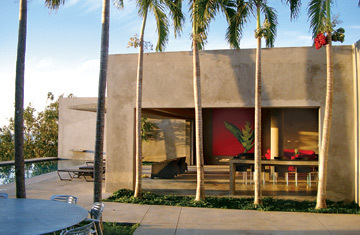 The three main structures, Casa Rectangular, Casa Redondo and Casa Triangular  in different shapes, as the names suggest  are set amongst the trees along a winding dirt road. In all of the rooms within, you are never completely separated from the outside world. There is no wall between room and balcony, only a metal gate for emergency use should a hurricane hit. It's usually sunny, but in the autumn rainy season you can hear, see, and feel the rain from a bed draped with a mosquito net, as if from a finely appointed cave. Vieques has terrifically serene beaches at either end and the bioluminescent bay is wondrous. But nights and mornings  fresh bread, eggs and coffee are brought daily  spent at Hix Island House are by far the most relaxing way to experience the elements. www.hixislandhouse.com; (787) 741 2302; rooms from $225.